Moonbug is a remix & mashup unit created by Novoiski, Nylonizm and Matsumoto Hisataakaa. Their masterpiece “Starry Sky YEAH! Remix,” the unofficial mashup of capsule × BEASTIE BOYS × DAFT PUNK, uploaded on Nico Nico Douga gained such a tremendous number of access in 2008 that they became extremely famous among net users. This mashup was played at the opening of “Tokyo Girls Collection,” one of the biggest fashions shows in Japan, and attracted even more attention from the audience beyond the boundaries of the Internet. Their 1st original album “BEATS & SPIKES” was released in 2010 as an indie album. 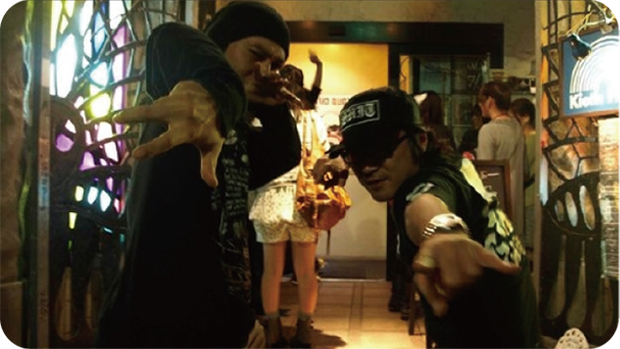 During the same year, a pioneer of remix music in Japan “Dub Master X” joined the unit. In 2/2013, their official album “REMIX ASSAULT” including remixes of various domestic/overseas artists via Sony Music Direct.